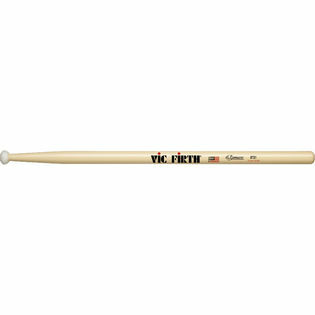 The Vic Firth MTS1 Tenor Stick...When you're looking for the same great feel of a snare stick‚ but with a slightly shorter length for tenors. The unique nylon tip helps pull more sound from the drum and gets great articulation with a defined high timbre. This was formally known as the SSJTS model. L = 16 1/4" | Dia. = .680"
They have great rebound and great feel to them. The only downside to these sticks is that they leave dents and marks in the drums but we continue to use them for marching shows. Great sticks! It has decent tonality and the articulation and consistency is much better than the tradition wood tip. However, the completly destroys the drum head due to the density and the shape of the tip and we use Remo Pinstripe on our tenors (which usually lasts a marching season or two depending on how hard you play). Within a few weeks of purchase, my drum heads were being broken every week and they were tuned and I don't play too hard. I would really only recommend these for performances and solo works but definitely not for practice. Love doing business with Steve Weiss Music! My son uses these. He says the MTS1 are great!! He noticed his performance increased when he switched to using the MTS1. I bought these for my son, as recommended, by his instructor for the Alta Loma High School Ent. Corp. He say they are real cool! Fyi, SWM was awesome, shipping them in 3 days upon a verbal request!! That is very refreshing! !